WASHINGTON -- While U.S. President Donald Trump tweeted up a storm Thursday, the massive trade negotiation he launched was off to a quick, quiet start in the boardrooms of a Washington hotel. Separate working groups on more than two dozen topics are holding their first encounters in this week's intial round of North American trade talks, including groups that will deal with some of the thorniest topics. Those working on government procurement and intellectual property were meeting Thursday; on auto-parts rules of origin Friday; and on agriculture Saturday, according to a schedule obtained by The Canadian Press. While the original talks were expected to focus on formalities, one official said they will go beyond the simple setting of schedules and will delve immediately into actual substance. He illustrated it with a sports metaphor: "It's like a hockey season -- with no preseason." Several participants have called it an unprecedented pace for international trade negotiations, prompted by Trump's election. The countries are aiming to get a deal wrapped up before the Mexican election next summer. The countries were working to table texts that will form the backbone of what's being called "NAFTA 2.0." The hallways of the hotel were lined with "NAFTA 2.0" signs, as officials moved between meeting rooms. Most of the media have moved onto other stories. The NAFTA story itself is not especially big news in the U.S. The president himself hasn't mentioned it this week. That level of discretion was in contrast with the racially tinged storm touched off on other fronts. In the morning, Trump tweeted support for preserving Confederate monuments. After a terrorist attack in Spain, Trump suggested that killing Muslim terrorists with bullets dipped in pig's blood might stop similar attacks. Meanwhile, his potential economic legacy was playing out in a hotel about two kilometres north of the White House. Trump's trade czar Robert Lighthizer kicked off the event by declaring himself on the same page as the president and insisting on major changes to NAFTA. He made a more specific remark that pointed to an irritant ahead on automobiles. He said he wanted to ensure substantial auto production in the U.S., which some interpreted to mean a special guarantee for his own country of a ratio of North American production. Both the Canadian and Mexican government have said they oppose the idea. But it hasn't been raised yet in formal conversations. The first major auto meeting is Friday. One senior Mexican official, speaking on background Thursday, said it's unclear what Lighthizer will seek. His own theory is that the U.S. will seek various avenues to steer manufacting to the U.S., and isn't wedded to one specific path yet. He said he believes Lighthizer was floating a U.S.-specific rule as a possibility: "He's hinting at it." The American negotiating strategy starts with the premise that trade deficits are bad, the U.S. has been running them for years, and the country needs to start importing less and exporting more. Most mainstream economists challenge that assumption. So does the Canadian government. 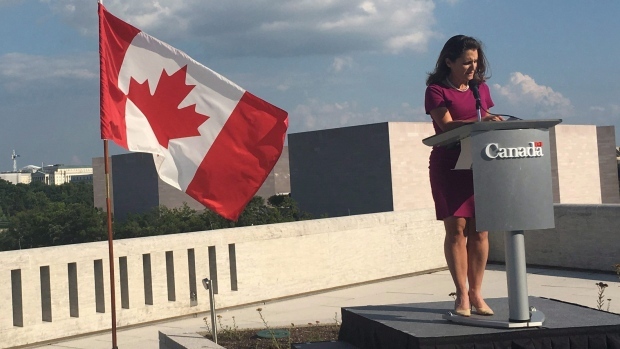 In any case, Canadian officials were in the hotel lobby Thursday handing out fact sheets to the reporters still present: Canada, says the fact sheet, bought more from the U.S. than it sold last year, anyway. 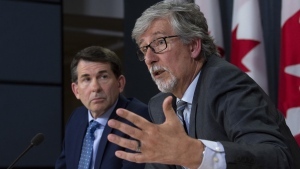 Canada's privacy czar is taking Facebook to court after finding the social-media giant's lax practices allowed personal information to be used for political purposes.